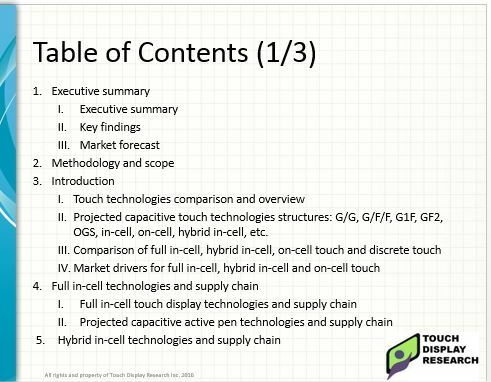 New report: In-cell, on-cell touch display market attracted over 40 companies - Touch Display Research, Inc.
Santa Clara, California, April 27, 2016—Touch Display Research announces the publication of “In-cell, On-cell, Hybrid in-cell Embedded Touch Display Technologies, Supply Chain and Market Forecast 2016 Report.” This report is a comprehensive analysis of the embedded touch displays. Over 40 companies working on embedded touch are profiled in the Excel database. 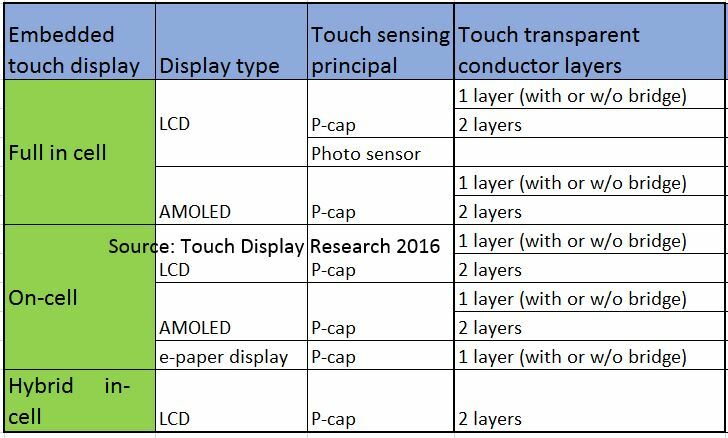 This report includes seven types of embedded touch display technologies: in-cell, on-cell, and hybrid in-cell. They are also divided to LCD, AMOLED, and e-paper display. This report provides not only the outlook for in-cell, on-cell, hybrid in-cell touch, but also analysis of the biggest changes and some solutions. Colegrove, author of this report, has been writing touch screen market research reports since 2006. Over the past 10 years, she conducted many first-hand interviews of display manufacture, touch IC suppliers and OEMs/ODMs. This report provides a regional analysis for the U.S., Japan, Taiwan, Korea, and China. Market data in the report includes 2014 and 2015 historical data and forecasts from 2016 to 2022. The market forecast includes embedded touch sensor unit, Area (square meter), ASP ($) and Revenue, with detailed breakdown by five application devices: Mobile phone and Phablet, Tablet and hybrid tablet PC, Notebook PC, wearable devices, and other app. The “In-cell, On-cell, Hybrid in-cell 2016 Report” is available immediately and includes a PowerPoint file (over 130 pages) and an Excel database. • Touch Display Research experts have been writing comprehensive reports on touch market for over 9 years. You can purchase and receive the report today. License for less than five users is $4200 for this report; License for five or more users is $4900 for this report.